Hopefully you’ve read our recent blog post detailing everything our travel experts did during their stay in Ireland with Lynchpin Tours. This post listed everywhere our agents stayed and ate, and let me tell you they stayed at some great hotels! Let’s take a more detailed look at everywhere they stayed, from Waterford to Dublin and everywhere in between. Glasha Farmhouse is located in the countryside, about 25 minutes from Waterford, Ireland. The idyllic farm bed and breakfast is run by a friendly woman named Olive. Breakfast is included here, and you won’t want to miss Olive’s specialty: apple porridge. The secluded location is ideal for a quiet holiday, away from the hustle and bustle. You won’t hear or see any highways or busy traffic while you’re here. Instead, you’ll hear birds chirping and see lambs playing in the fields during spring time. The traditional decor will make you feel like you are indeed in Ireland, and a bit like you traveled back in time to something unique, refined, and comfortable. Check out some of our agents’ photos below, and head to their website for an interactive 3D tour of the property, including the garden, the conservatory, the dining room, accommodations, and more. The next home base for our agents during their tour of Ireand with Lynchpin Tours was Kinsale. Here they stayed at Trident Hotel. 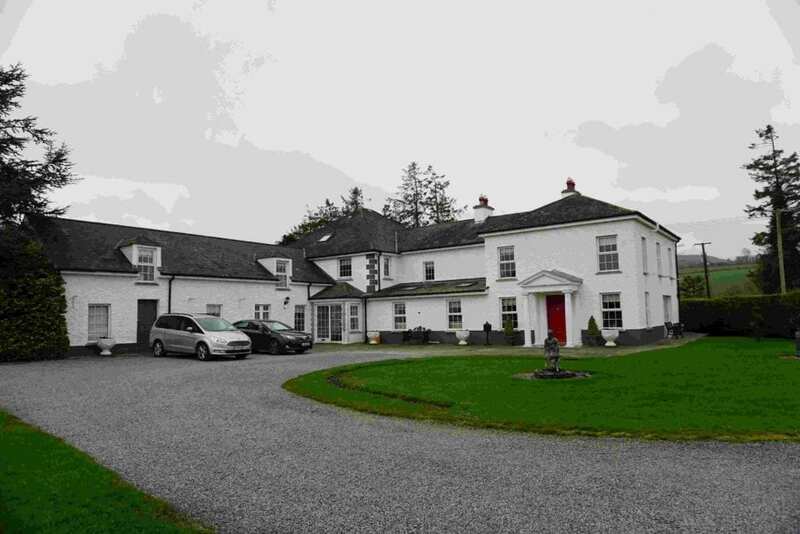 This property is located about 35 minutes from Cork by car. 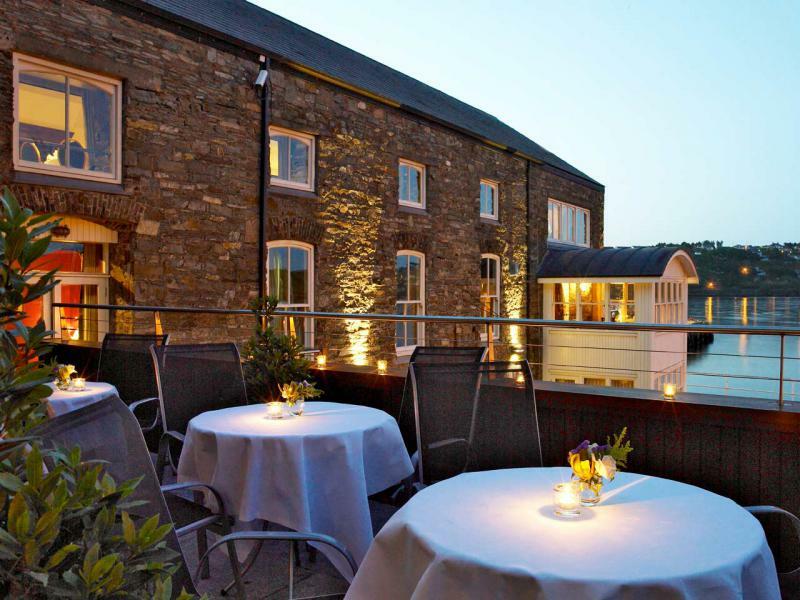 A great selling point to this hotel is the gorgeous views of the Kinsale harbor. In addition, you’ll find a lovely restaurant on-site that also boasts spectacular harbor views. 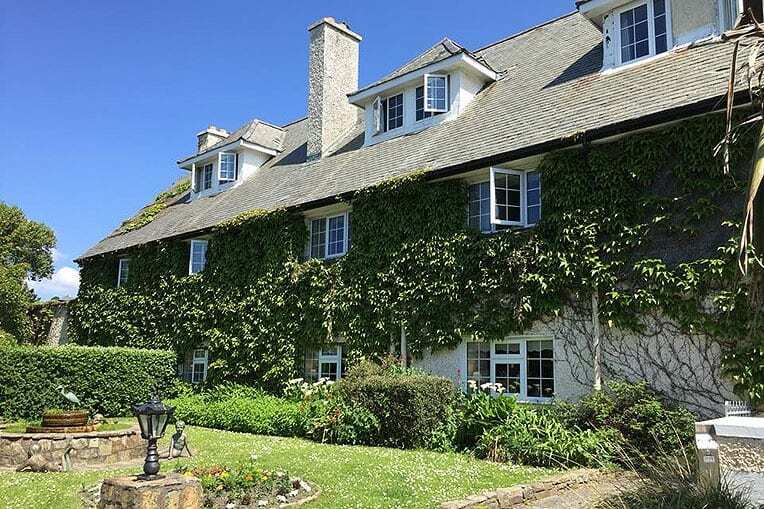 This hotel is a bit more updated and modern than Glasha Farmhouse, but still offers the idyllic setting for a relaxing holiday. Plus, you’re right in the middle of the action of Kinsale with tons of activities and nearby restaurants and bars to peruse. On their third night with Lynchpin Tours, our agents stayed at a terrific guest house in Killarney. Gleann Fia Country House is located about 5-10 minutes from Killarney’s town centre, at the gateway to the Wild Atlantic way in the ancient kingdom of Kerry, as their website boasts. Your stay includes a full made-to-order breakfasting, including honey from hives located right in the house’s backyard! The four acre site is as charming and idyllic as it gets, with beautiful gardens surrounding a Victorian style country home. The boutique property is open year-round and ideally situated at the edge of a wooded river valley known as “The Fairy Glen”. In Galway, our travel experts stayed at Renvyle House Hotel & Resort. 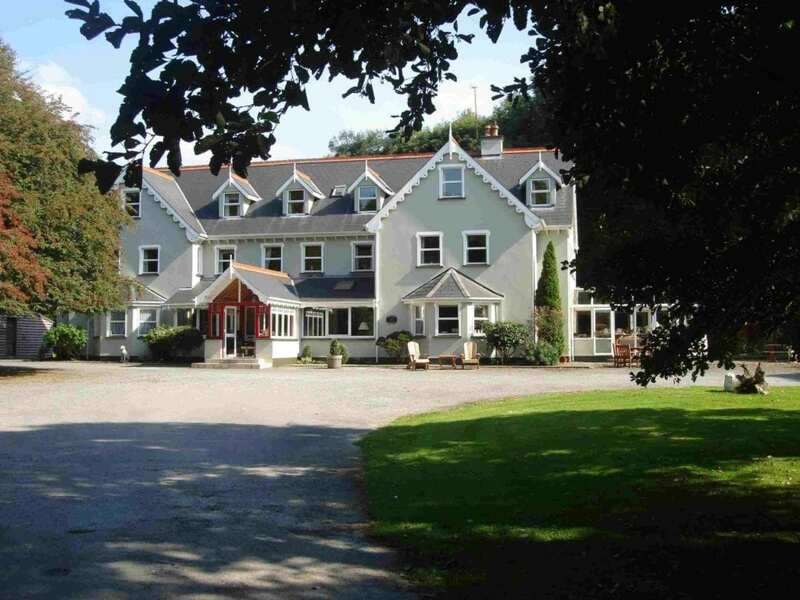 This lovely country house hotel sits on the shores of the Atlantic. The cozy lodge-like property has a bar and restaurant on-site. Roisin Dubh rsetaurant is open for breakfast, lunch, dinner, and bar snacks daily. In addition, you’ll find plenty of leisure activities including a gorgeous swimming pool and tennis courts. The property is also home to a private freshwater lake, a beach on the Wild Atlantic Way, woodlands and gardens. You can also play croquet or enjoy the walking trails on the property. After the four day tour through Ireland with Lynchpin Tours, our travel experts headed back to Dublin and parted ways (after a few pints at the Guinness Storehouse of course!). Graci and her husband stayed at The Alex Hotel. 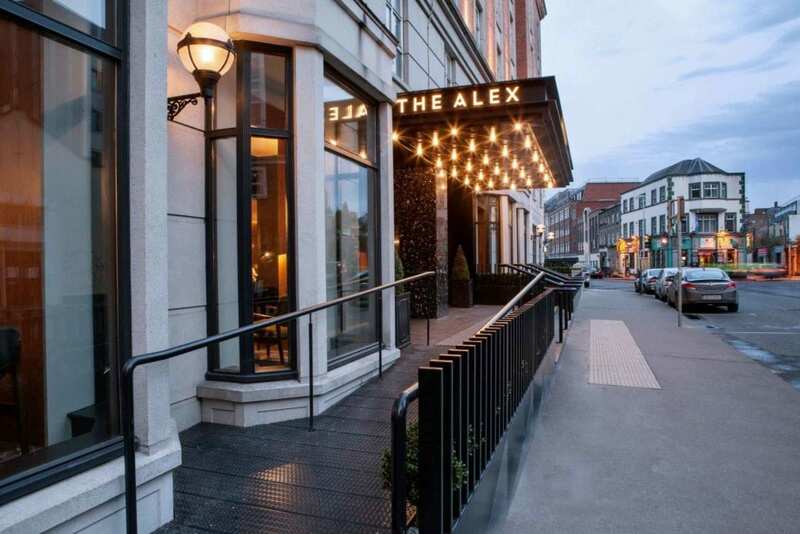 The Alex Hotel boasts impeccable style and stunning decor, in addition to luxurious bedrooms. The chic boutique-style hotel has a bar and restaur. ant, a coffee shop complete with a pastry and sandwich menu, and a gym. The location of The Alex Hotel is also ideal for travelers. It is located in Merrion Square, an eclectic area that has grown immensely in the last few years. It is also close to Trinity College’s campus, which Graci and her husband spent a day exploring. Our travel expert Kyle and his wife Kat stayed at the Ashling Hotel during their time in Dublin. 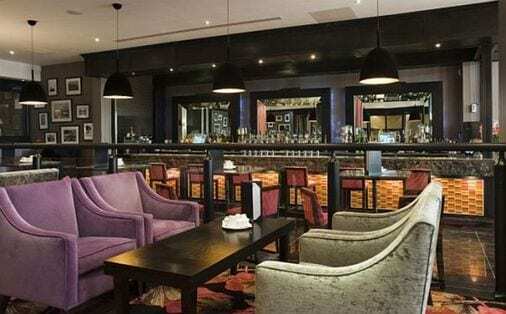 Here you’ll find Iveagh Bar and Chesterfields Restaurant, both great dining and drinking choices located on property. Check out their menus here. It is conveniently located near Dublin City Centre. You can get there via a scenic 20-minute walk along the picturesque River LIffey. Alternately, you can hop on the Luas tram which will take you directly to City Centre in just 5 minutes. Kyle and Kat also spent some time in Belfast. They traveled to Belfast by train from Dublin. 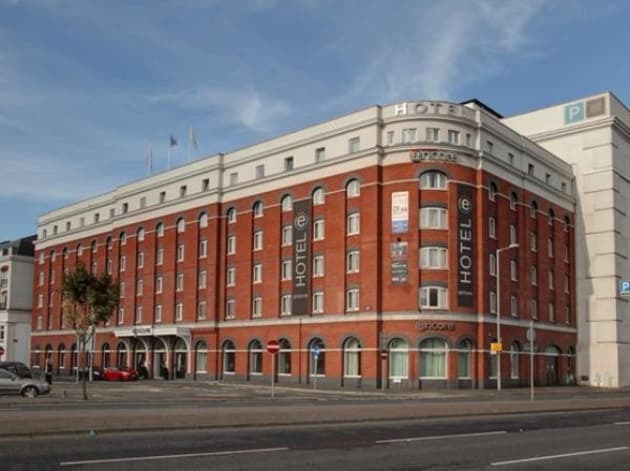 While in Belfast they stayed at the Ramada Encor, located in the City Centre and Belfast’s “Cathedral Quarter”. There is much to explore and do in this area, and a great place for Belfast first-timers to stay. The three-star hotel overlooks St. Anne’s Square with plenty of popular bars and restaurants just steps from the property’s doors. It is also just a 2 minute walk from Belfast’s shopping district, Castle Court and Victoria Square. In addition, Ramada Encor is within walking distance of many tourist attractions like Belfast Cathedral, City Hall and the MAC theater. Want to hear more about these properties or book your own adventure in Ireland? Call us today to speak to our Ireland travel specialists. You can reach us at 402-390-9291 or get started here.